Do you dream of a Big Day filled with sophisticated, cosmopolitan style? Houston has several centrally-set venues that are sure to impress guests with grand, skyline views and bold interiors. From its setting on the south side of Discovery Green park, The Grove looks out to a stand of mature live oaks. The two-story, ultra-urban restaurant offers revelers three enclosed private rooms and one outdoor deck space that give guests a bird&apos;s-eye view of the city. In addition to its sleek glass, wood and steel interior, guests will find a menu designed by James Beard winner and Chef Robert Del Grande. The Heritage Society is Houston&apos;s only outdoor, interactive historic museum and park. Nestled in 10 acres of beautiful green parkland in the heart of Downtown Houston, The Heritage Society boasts nine historic structures dating from 1823 to 1905. Tie the knot inside St. John Church, before enjoying a tented reception in Connally Plaza, all with dramatic skyscrapers serving as your wedding day backdrop. 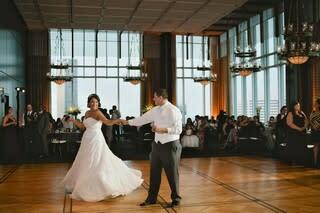 Dance your wedding night away at Downtown&apos;sHilton Americas-Houston. The 1,200-room property offers grand views of the city, just across the street from Discovery Green Park. Brides have 91,500 square feet of event space to consider, including the pillarless Grand Ballroom and Ballroom of the Americas, both of which offer pre-function space overlooking Downtown. The Hobby Center for the Performing Arts is a state-of-the-art, $100 million theater complex anchoring Houston&apos;s Theater District. Designed by American architect Robert Stern, the Hobby Center features two distinguished theaters; Fayez Sarofim Hall, a 2,650 seat theatre, home to Theatre Under the Stars and Broadway in Houston, and Selim K. Zilkha Hall, a 500 seat proscenium theater. In addition to the theaters, the Grand Lobby boasts panoramic views of Downtown with its 60-foot glass façade and space for a seated, 500-guest dinner. Established in 1894, The Houston Club is a member-owned private club and is the oldest in the Southwestern United States. Located on the 49th floor of One Shell Plaza, the 15,000-square-foot venue recently moved from its longtime home and into the newly renovated digs that look towards the Bay Area. The space makes room for two restaurants (one casual, one formal), meeting spaces and a ballroom for 200 guests. Nestled within Houston&apos;s lush Museum District, Hotel ZaZa is a dynamic and personality-filled venue to celebrate your wedding. The property boasts several party-ready spaces to choose from, including the grand Phantom Ballroom, with its floor-to-ceiling windows overlooking the Mecom Fountain and dramatic chandeliers, as well as the intimate Napoleon dining parlor, perfect for cocktail receptions. Minute Maid Park, the home of the Houston Astros, is more than just a stadium, it&apos;s also a picturesque spot for weddings and receptions. In addition to the elegant Union Station, which was originally constructed in 1911, couples can book The Field and/or Union Station Rooftop spaces for their Big Day, which both boast prime views of the H-Town skyline. The historic Petroleum Club of Houston has hosted some of the city&apos;s most sophisticated events, offering the Downtown skyline as its backdrop. Located on the 43rd and 44th floors of the ExxonMobil building, the facility offers on-site catering and 10 separate function spaces for everything from weddings and receptions to fundraisers and catered parties, as well as accommodations for three to 300 people. Find five unique ballrooms to choose from between The Westin Oaks Houston at the Galleria and its sister property, The Westin Galleria Houston. Both located inside The Galleria mall, the two properties are party ready with both intimate and expansive venues. For drama, however, it&apos;s hard to beat the view from the Monarch Ballroom, which is located on the 24thfloor and affords grand city views through its floor-to-ceiling windows. For an al fresco option, the hotel also offers a rooftop vista, prime for parties of 100 to 150.